Get up to 7 free auto shipping quotes from the largest, most trusted New Mexico auto transport companies and save up to 50% on your car shipping rates at CarMoves.com. Car shipping companies in New Mexico compete for your business, which is how you can save hundreds, if not thousands of dollars on car transport services by shopping with us. Whether you're shipping a car to New Mexico, across the country, or even overseas, we can help you get the best price on your shipment - guaranteed! Read more about the following auto transport companies in New Mexico before getting a quote. Click on the name of the company to read a full review. Get a free auto transport quote today to find out how much it costs to ship a car to or from New Mexico! New Mexico is, perhaps, one of the most truly American states. Located in the Southwestern US just east of Arizona, New Mexico has kept strong ties to centuries old traditions of the Southwest. The state has the second highest percentage of Native Americans compared to the total population of state. The predominant Pueblo Revival architecture has been preserved in Albuquerque, the largest city in New Mexico. A great number of artists have tried, with varying degrees of success, to recreate the Southwestern art and style present in cities like Albuquerque and Santa Fe. Perhaps the most famous and successful of these is Georgia O'Keeffe, a painter whose landscapes of the desert terrain were both fantastic and sensual. As a result of her deep love of the state, she spent the majority of the latter half of her life in New Mexico. The history of New Mexico is quite interesting as well. The area encompassing the state changed hands several times during the 19th century after first being held by the Spanish. Parts of the territory were claimed by both Mexico and the Republic of Texas, but both gave up claims to the area shortly following the end of the Mexican-American War. The state's semi-barren deserts were also used as top-secret nuclear bomb testing sites during World War II at the Los Alamos National Laboratory. In modern times, the state has become somewhat of a hotspot for video productions, as shows like Breaking Bad shoot onsite in various locations around the state. 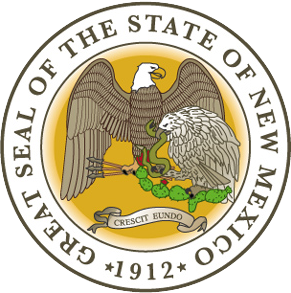 In addition, oil and natural gas mining efforts in New Mexico are quite extensive, resulting in the state being the third largest producer of crude oil and natural gas in the nation. Though New Mexico is known for its desert vistas, northern regions of the state are quite mountainous. As such, it attracts a number of outdoor enthusiasts and climbers each year. In addition, spelunkers and cave explorers are always excited to visit Carlsbad Caverns in far southeastern New Mexico, a stunning cave that features large chambers made of limestone deposits. New Mexico has just about something for everyone, and is one of the best examples of the classic Southwest in the United States. CarMoves.com works with car shipping companies throughout the state of New Mexico. We can help you get the best prices on car transport services to the following cities in New Mexico: Albuquerque, Las Cruces, Rio Rancho, Santa Fe, Roswell, Farmington, South Valley, Clovis and many more. If you don't see your city listed, don't worry - we can get your vehicle shipped anywhere in New Mexico. Scroll to the quote section on this page to compare free auto shipping quotes from up to 7 New Mexico auto transport companies and save up to 50% on your move! View the New Mexico Department of Transportation website for more information.